NASA's Cassini mission has revealed the small, icy Saturn moon Enceladus to be one of the solar system's most scientifically interesting destinations for future exploration. BOULDER, Colo. — NASA's Cassini mission to Saturn has transformed scientists' understanding of the ringed planet and its retinue of icy moons. For example, Cassini discovered that the Saturn satellite Enceladus is a mini-world of active jets — geyser-like phenomena that blast out water vapor and ice particles from the huge, salty ocean that lies beneath the moon's icy crust. 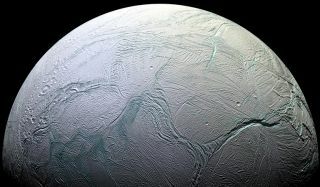 A conference called "Enceladus and the Icy Moons of Saturn" was held here from July 26 through July 29, bringing together top experts to the first major international conference devoted specifically to Enceladus and Saturn’s family of super-chilly moons. The event was supported by the Universities Space Research Association and the Lunar and Planetary Institute in Houston. This view of Enceladus, captured by NASA's Cassini spacecraft, is backlit by the sun and shows the fountain-like sources of the fine spray of material that blasts from the Saturn moon's south polar region. Cassini has performed many flybys of Enceladus since arriving in the Saturn system in July 2004, sometimes even cruising through the plumes generated by the geysers, which erupt from "tiger stripe" fissures near the moon’s south pole. "The jets must be supersonic, with Mach numbers of two or greater, but because of cooling of the water vapor in the eruption throat, the actual velocity may not be as high as we thought previously," said Larry Esposito, a conference organizer and a professor of astrophysical and planetary sciences in the Laboratory for Atmospheric and Space Physics (LASP) at the University of Colorado, Boulder. "But it's still greater than one kilometer per second … and that's faster than a speeding bullet!" "Enceladus possesses habitable locales, but does it contain life?" Esposito told Space.com. One research team, for example, is building an Enceladus "ocean reactor" in the lab. The simulated ocean should yield insights into a series of possible geochemical reactions that are likely happening near the moon's core, where water-rock interaction is coupled to the thermal cycling of sea water, said team member Kosuke Fujishima, of the Earth-Life Science Institute at the Tokyo Institute of Technology. "Adding organics was one of our latest attempts to see what kind of organic species can be generated in the same context," Fujishima said. "I think this type of work is very important from the astrobiology perspective, since we need to understand what we are expecting to find from the plumes of Enceladus, and how we interpret the profiles of organics in comparison to biological and pure geochemical outcomes." "Our team, as well as several other teams, is hard at work on how to capture the plume particles with either aerogel or metal plates," Fujishima said. Aerogel is a synthetic, ultralight material nicknamed "frozen smoke." NASA's Stardust mission used aerogel to trap dust particles during a comet flyby in 2004. "The technical difficulty is simulating the snowflake-like particles in the [plume] jet and mitate[ing] hypervelocity impact while keeping the crystalline snowflake cold enough so that it wouldn't melt," Fujishima said. That's because any putative Enceladus life-forms may be quite different from those on Earth, and recognizing them as life-forms at all may be beyond the abilities of a robotic probe far from its handlers, McKay said. "The history of planetary science shows us that we develop theories and models, and nature does not read our papers," McKay said. "Who knows why? So we go out there, and we're surprised." Finding some sort of "strange life" on Enceladus would, of course, be an epochal discovery. "That would be pretty cool, but that's a high bar to set. Not only to find life, but find enough evidence to convince skeptical reviewers that it's different and distinct," McKay said. A plume fly-through is preferred over a lander mission, at least initially, because scientists don't know Enceladus' surface characteristics at the scale of a lander very well, Fujishima said. A lander mission would therefore likely have to be preceded by a scouting run of some sort, he added. But some researchers are working to get hardware down on the Saturn moon's icy surface. The logo of the German space agency's Enceladus Explorer project, which is studying the technology required for a potential lander mission to the Saturn moon. The prospect of liquid water at Enceladus' south polar terrain makes it an attractive target for a lander, said Fabian Baader, a member of the Enceladus Explorer (EnEx) project team at the University of Applied Sciences in Aachen, Germany. The EnEx initiative is focused on evaluating the technology needed for a potential lander mission with the deployment of a subsurface melting probe. EnEx is funded and managed by Germany's space agency, known as DLR; several German universities are involved in the project. Baader said the project team is conducting research into the suitability of combined drilling and melting probes for extraterrestrial application on Enceladus. Several prototypes of melting probes — including one known as "IceMole" — have been designed at the University of Applied Sciences in Aachen since 2009, Baader said. It's too early to say what a drilling/melting-probe mission would look like, he told Space.com. "Considering the IceMole melting probe, one big unsolved question is energy supply. Should it be carried on the probe or be placed on the surface?" Baader said "So far, as yet, there hasn't been a conclusive study. A lot of, let me call it extensive guesses, is all we have right now." Another point Baader raised is where to land on the Saturn moon. "As we learned recently, the tiger-stripes regimes on Enceladus are quite rough, and there's no nice place for a lander. How far away does it have to go? Fortunately, on the melting part of the mission," Baader said, "this has small influence since the IceMole probe shall have navigation and obstacle avoidance ability. It influences the overall mission energy demand, though — that is, longer melting path and potentially colder ice." Baader said that many features of the IceMole probe have already proved themselves here on Earth — in field tests on glaciers in the Swiss Alps, Iceland and Antarctica, for example. The probe is comparably easy to sterilize and is able to take clean samples of special protected Antarctic areas that are similar in key ways to icy alien worlds such as Enceladus, he added. "All together, I think for a lander mission for Enceladus, a realistic time scope could be around 20 years," Baader said. What if an Enceladus life-hunting mission finds nothing? "How do we approach that question from a measurement point on a mission … that indeed there is a habitable environment on "How do we approach that question from a measurement point on a mission … that indeed there is a habitable environment on Enceladus, but it was vacant?" McKay asked., but it was vacant?" McKay asked. He said that this concept is not very familiar to researchers on Earth. "That's because Earth is lousy with life," he said. "So it may not be a good model for elsewhere. We don't know."